This lavish, posh and unforgettable wedding was a highlight for a Manhattan Penthouse Wedding Photographer. The Manhattan Penthouse is an exceptional venue and creates a day that is the epitome of what a New York City wedding should be. The venue is an extraordinary, loft-like, finished and richly detailed penthouse, with ample photo opportunities for a Manhattan Penthouse Wedding Photographer. Receptions at the penthouse can take place in the Reception Room with its Palladian windows and breath-taking views of the New York City skyline, with specific focus on the Empire State Building. Couples may also choose to celebrate in the venue’s Ballroom, with its herringbone dance floor. The ballroom also boasts skyline views that will have guests gazing out at the twinkling city lights in wonder. 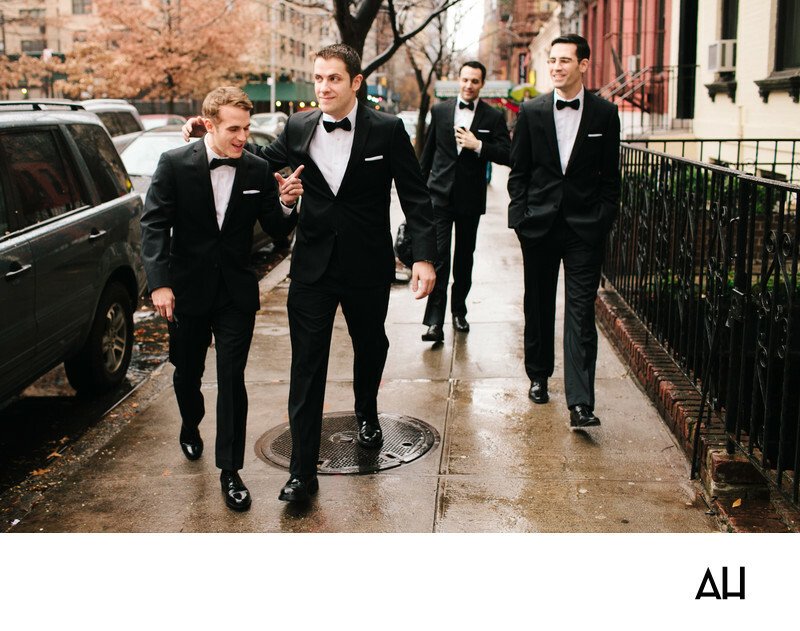 This image shows the groom and his groomsmen on their way to the venue at a break in the afternoon autumn rain that has washed over the city. In the picture, brown and orange tree leaves speckle the pavement, and those that have not yet fallen have fully turned to fall colors in preparation for winter. The groom and his men don’t seem to mind the wet sidewalk or the chill in the air as the saunter on; the love and comradery that has marked the day thus far is keeping the damp out. The men wear traditional black tuxedos with black bow ties, looking especially dashing against the backdrop of the rainy fall day. They joke with one another and enjoy this moment as they journey down the streets of the Big Apple. Soon, they will reach the venue and the celebrations of the day can truly begin.